If what they claim is true, why is there a glaring difference between the “instruction” and what they actually say? 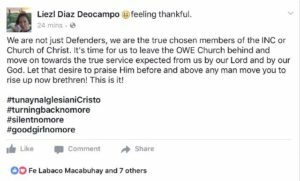 Why is there no mention of “Church” after the word OWE in the instruction yet in their postings they emphasize that the defenders and members should leave the Church behind? What they’re doing is equivalent to apostasy. Their long cry for Church restoration has become separation from the Church. If they insist that they are still after the restoration of the Church, then they have given a new meaning to the word. Restoration (which means to repair or renovate) should be done to the Church or inside and not outside it. This is the reason we used to be united in exposing the wickedness in the Church because we all wanted changes for the Church to be restored. The reason they give for openly advocating separation is that, “the services they (the OWES) do is an abomination … (thus) members should get out of the untrue and the abominable.” Indeed, many church leaders, ministers and members are untrue and their works are abominable, but the Church which is Christ’s body remains true and clean in the sight of God having been cleansed by Christ’s blood. The premise they use to justify their action is extremely faulty, unscriptural and dangerous. Faulty, because the abomination of the OWE ministers and members does not necessarily render the only true Church false. For hundreds of years, Israel was led by evil leaders and kings who tried to mislead the Israelites, but they remained as God’s chosen people until the time that the whole Israel turned away from Him. We need to remember the doctrine that the Church is the fold or the sheep pen and what enfold the sheep are the words of God. Although there are now many “lost sheep” (the owes) led astray by their shepherds who are “hirelings” (owe ministers), it does not mean that the fold or the sheep pen has lost its value and that the remaining sheep within should be led or driven outside. What this group claim that the whole Church has been turned away from God is “unscriptural” because it goes against the doctrine of God taught by God’s last messenger, Brother Felix Y. Manalo and by Brother Eraño G. Manalo. It is written in the prophecies that the Iglesia Ni Cristo is the third group or the last of the three groups (no more 4th group) that will comprise the whole Church, thus, it will last until Judgment Day and will no longer be turned away (Zech. 13:7-9; Acts 2:39; Rev. 14:12-15). This is they reason, even the said group of defenders used to advocate restoration but now, whether they accept it or not, promotes separation. “Dangerous” indeed, because the members they have convinced (or deceived) are in danger of eternal destruction on the Day of Judgment. To all “silent defenders,” we do not enjoin you to separate from the Church but to defend it by means of standing by what is right and to never follow instructions from evil ministers that go against the true doctrines we have received. If you will be delisted or expelled by them for defending and standing by the truth, so be it. Believe that God allowed it to happen, however, it wasn’t Him who expelled or delisted you because it is against His law to expel those who expose the wicked and the wickedness, but only those who are evil I Cor. 5:13 Thus, believe that He will never forsake you.